The next morning it was still raining but we continued with our planned itinerary starting with the Metro about 200m from our hotel. Easy peasy! The automatic ticket machine had an English button which magically turned everything into English but we still couldn’t work out the system so reverted to the ticket office. 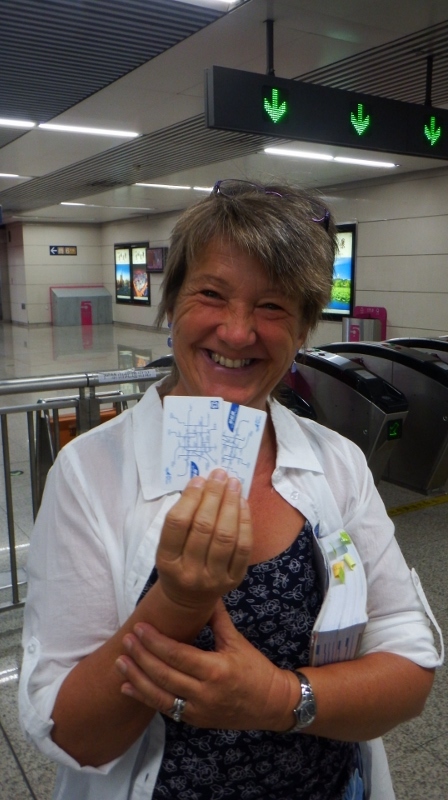 With a copy of the underground system and pointing we acquired 2 tickets to the Lama temple which was 3 stops north from Dongsi on the same line so we managed that. 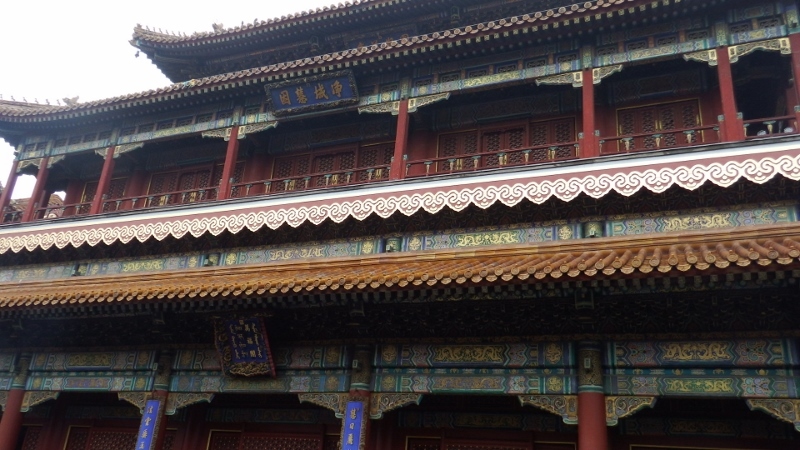 We knew the Forbidden city was closed today along with the surrounding area for the big parade to celebrate VJ day so our first stop was the Lama Temple. 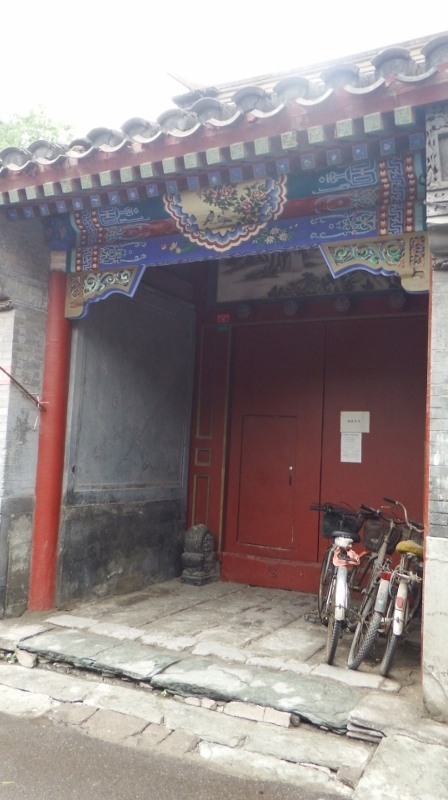 The most renowned Tibetan Buddhist temple outside of Tibet, the Lama Temple was converted to a lamasery in 1744, before that it had been a residence of Emperor Yong Zhung and is one of Beijing’s must see’s. 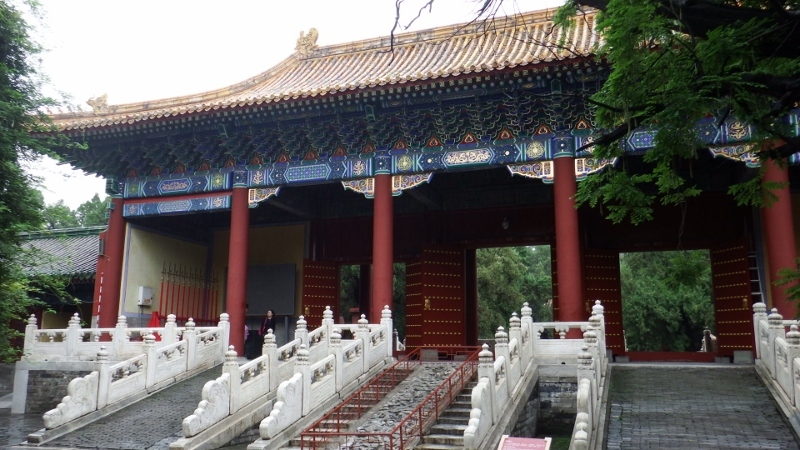 The entrance gate was superb which led down a leafy walkway to the numerous temples within. 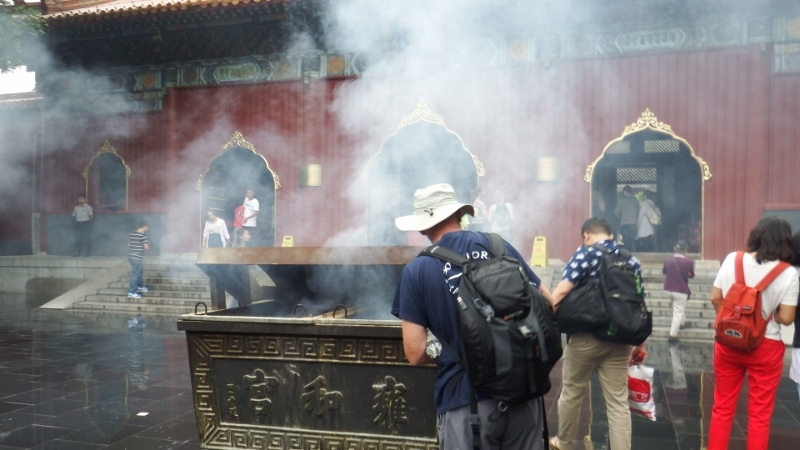 The first sight to greet us was one of dense clouds of burning incense. 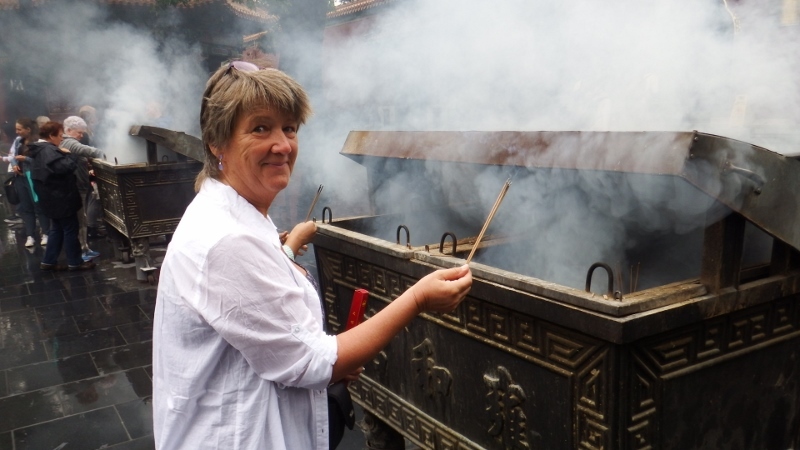 They were giving away boxes of incense sticks to be burned and we were encouraged to join in. The magnificent decorative arches with their beautifully painted frescoes and shaped roofs on all the buildings were superb. Even in the rain it looked stunning. 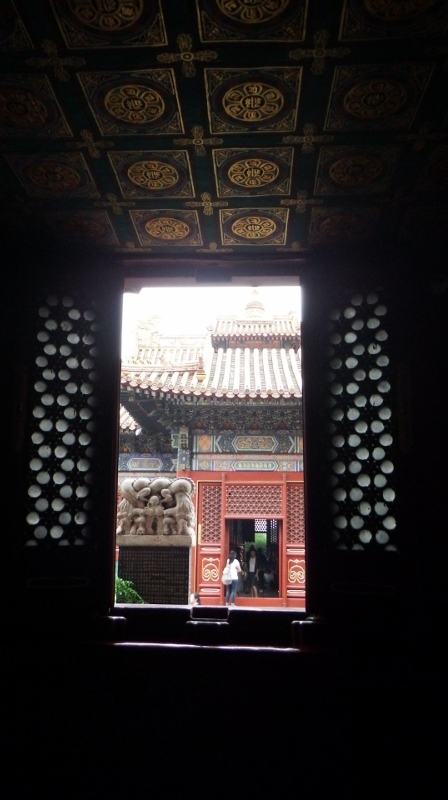 Inside the ceilings were also beautifully painted and decorated and, like a lot of Chinese temples, each building led to a courtyard that led to another building and so on. 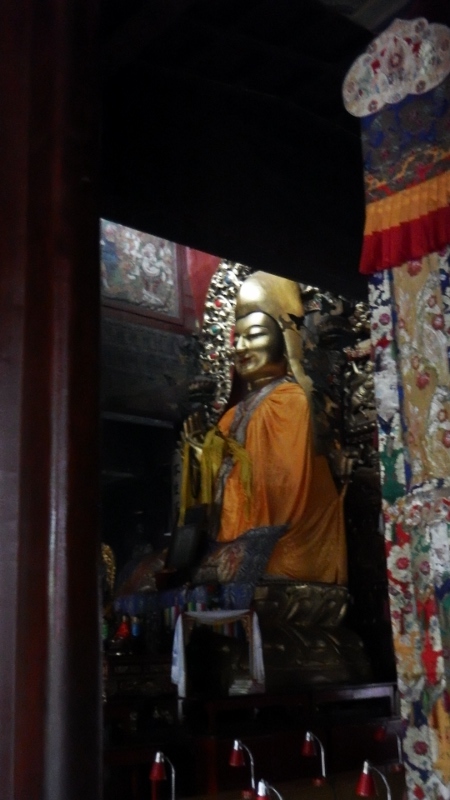 Inside the fourth hall, with a catchy little title of ‘Hall of the Wheel of Law’, was a substantial bronze statue of a benign and smiling Tsong Khapa (1357 – 1419) founder of the Gelugpa or yellow hat sect dressed in yellow and illuminated by a skylight. 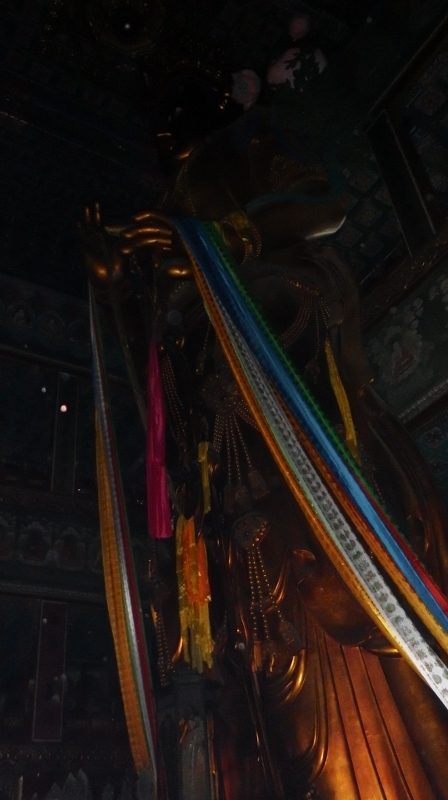 The fifth hall known as the Wanfu Pavilion houses a magnificent 18m high statue of the Maitreya Buddha in his Tibetan form reputedly sculpted from a single block of sandlewood. Unfortunately the light was very dim and flash isn’t allowed so the photo is difficult to make out. 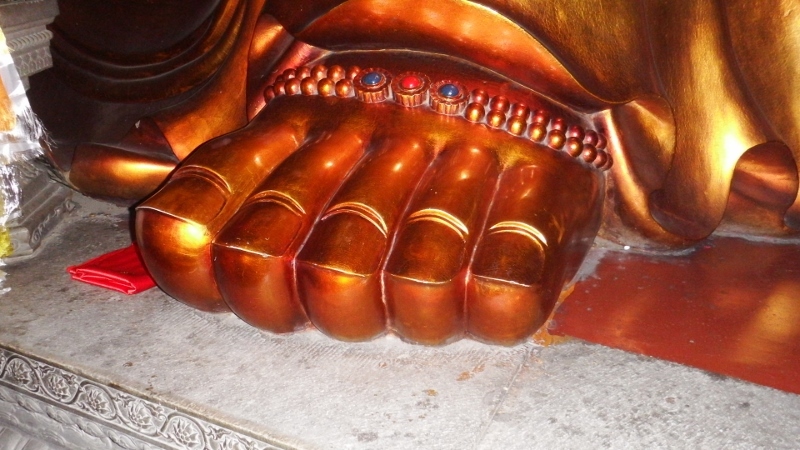 Each of his golden toes is the size of a pillow. 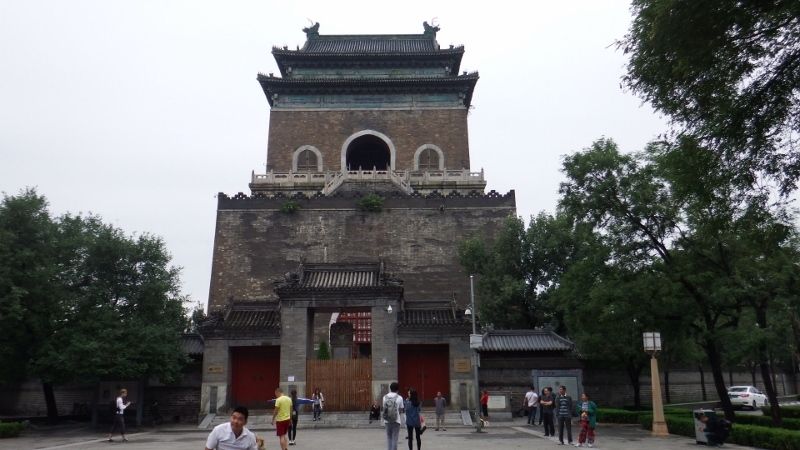 After visiting each of the building we made our way back outside and continued 5 minutes along the road to the Confucius temple. 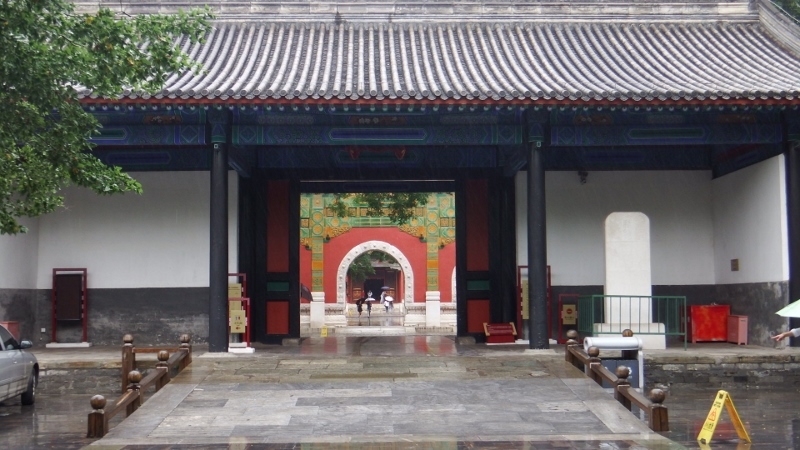 As China’s second-largest Confucian temple it had a magnificent archway at the entrance. It was very quiet and peaceful inside. 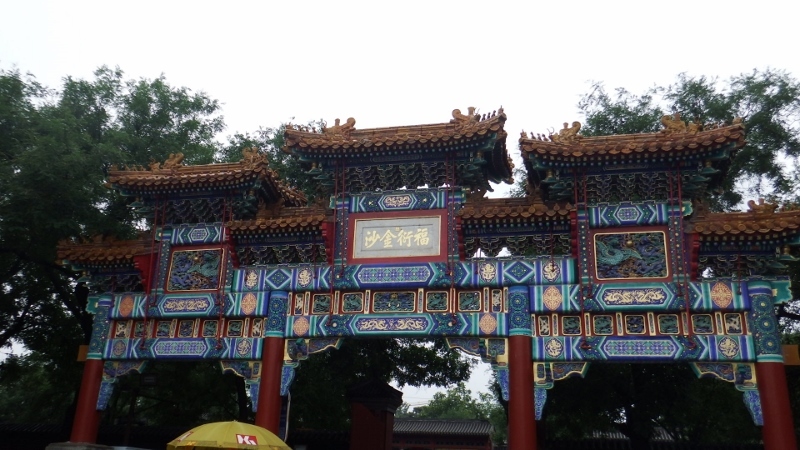 Next to the Confucius temple, but within the same grounds, is the Imperial college. 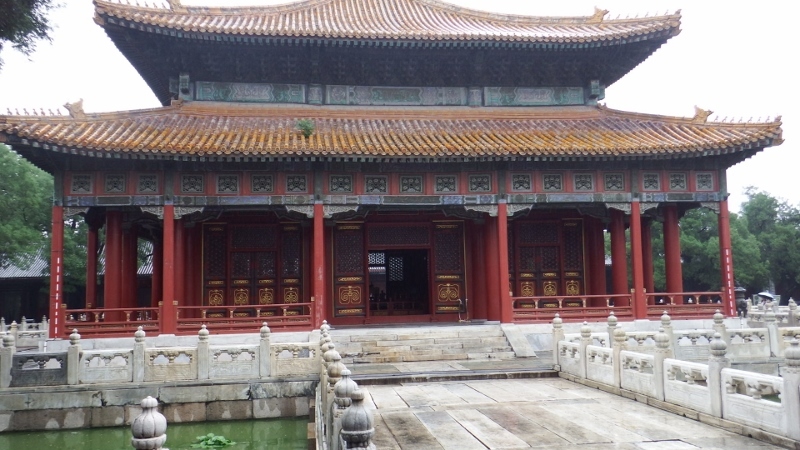 Built by the grandson of Kublai Khan in 1306, the former college was the supreme academy during the Yuan, Ming and Qing dynasties. 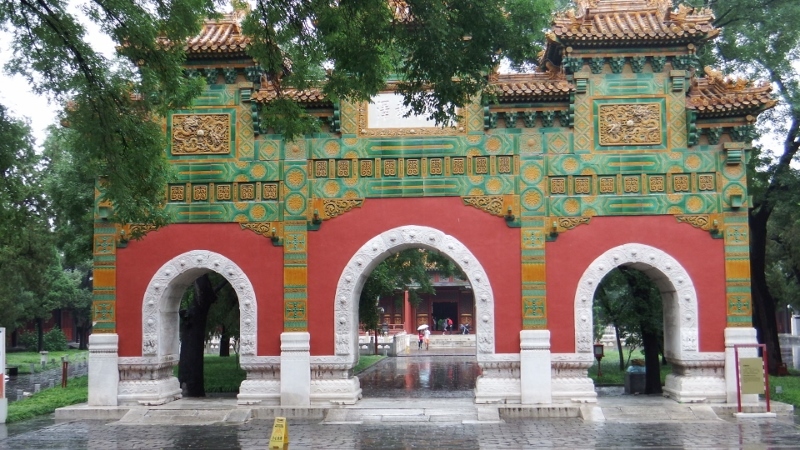 This is the marvellous glazed, three-gated, single-eaved decorative archway. Beyond that is the Biyong Hall with its twin-roofed structure with yellow tiles and surrounded by a moat. It’s topped with a shimmering gold knob but I managed to cut it out of my photo. 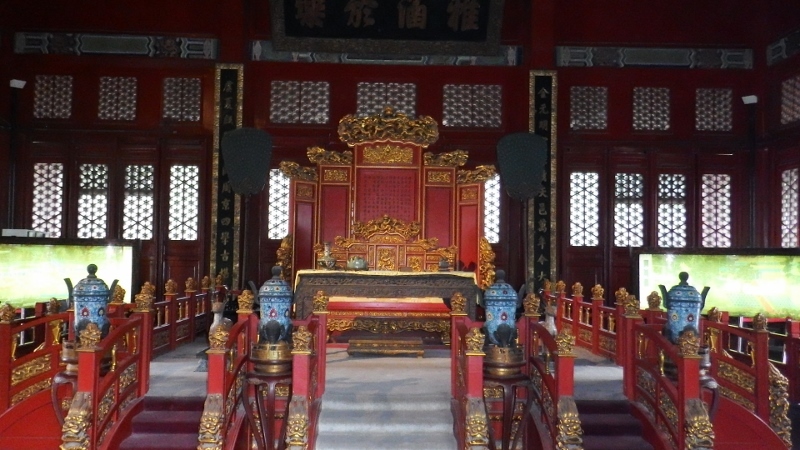 Inside is a replica of Chair (throne?) 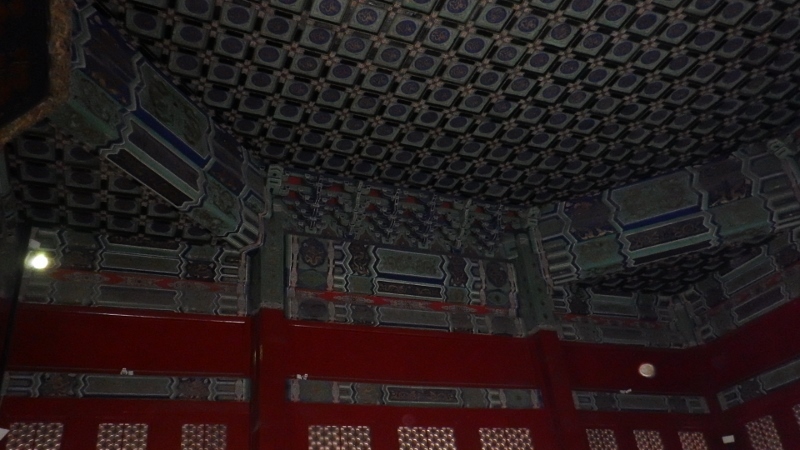 that Confucius used and the decorated ceiling was exquisite. 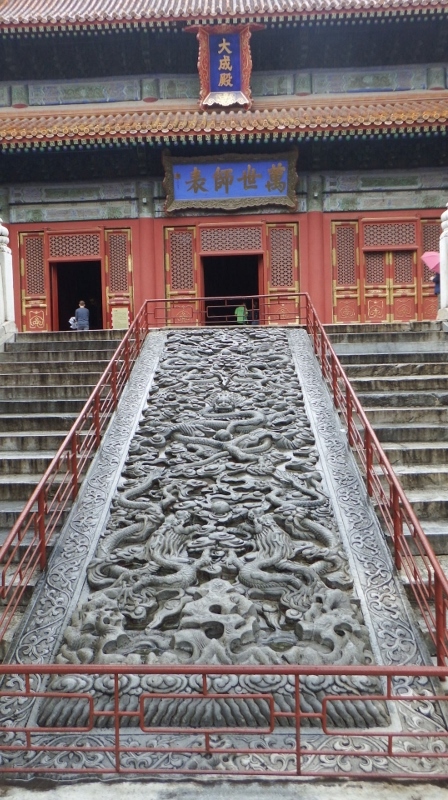 Outside we noticed a number of entrances had these wonderful causeways with carved base reliefs. Wise Bill with wise Confucius. 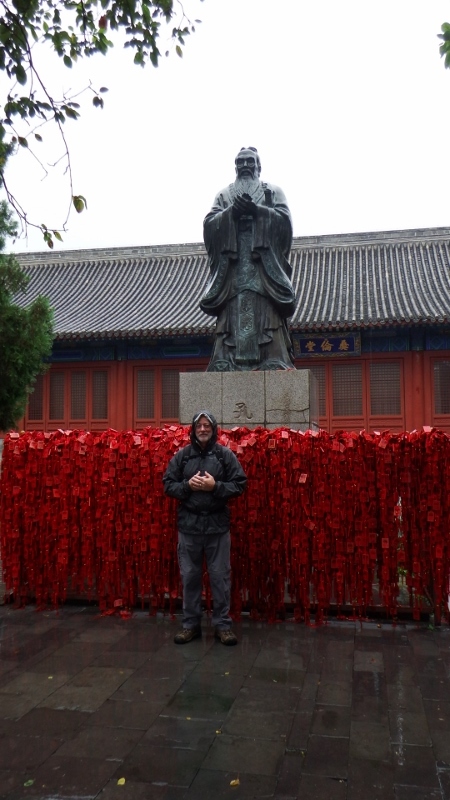 Just down the road from the Confucius temple was the Confucius café where I had a delicious hot coffee to warm me up – strange concept for us, and lunch. Then it was back to the Metro for another ride. It was only 3 stops south on line 4 but we are taking things in small hops. The ticket machine wasn’t going to beat me this time. Bill and I had been discussing this infernal machine and worked out that the numbers along the top were the route lines and you needed to pick a line before it gave you the option to choose which station. Sure enough that’s what it needed, I chose our station, taped 2 for 2 tickets, fed the machine 4 yuan (about 40p) and hey presto out came 2 tickets – cracked it! 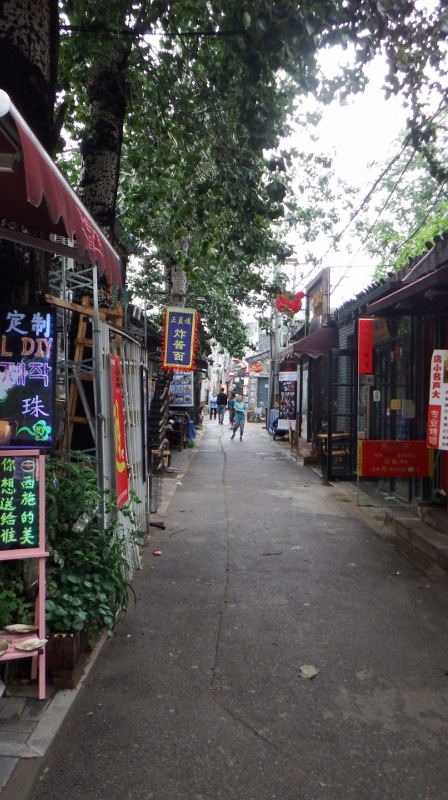 The afternoon’s excursion was into the Hutong alleys of the Nanluogu Xiang. The popular way to see the Hutongs is in a pedibike (a modern version of a rickshaw) but we decided to walk around by following the walking tour in the Lonely Planet. Unfortunately we were scuppered fairly early on because the instructions were ‘At no 19 turn right through a connecting passageway.’ After no 19 there was a new public loo built in the passageway so that was that. 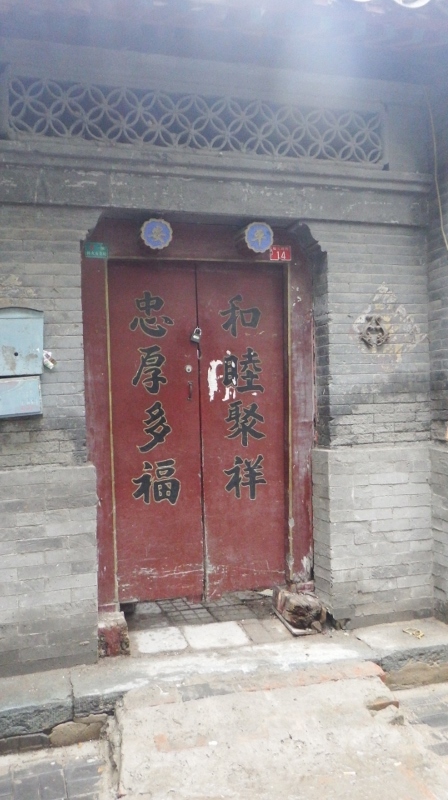 In fact there seemed to be lots of public loos dotted around the alleyways and it wasn’t until later that we realised these buildings had been built long before any one had private bathrooms. Not sure what they used to do! 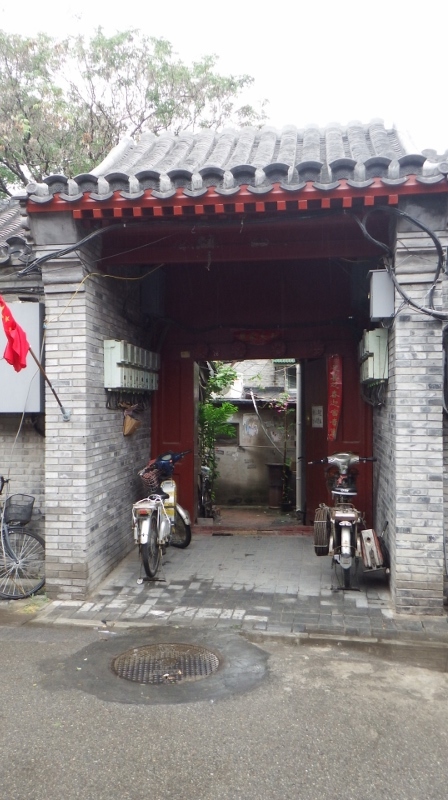 So we just wandered past the many entrance ways to these charming courtyards, usually at the southeastern corner as prescribed by feng shui. Although many of them were shut I couldn’t help wondering what stories these lovely gates could tell. 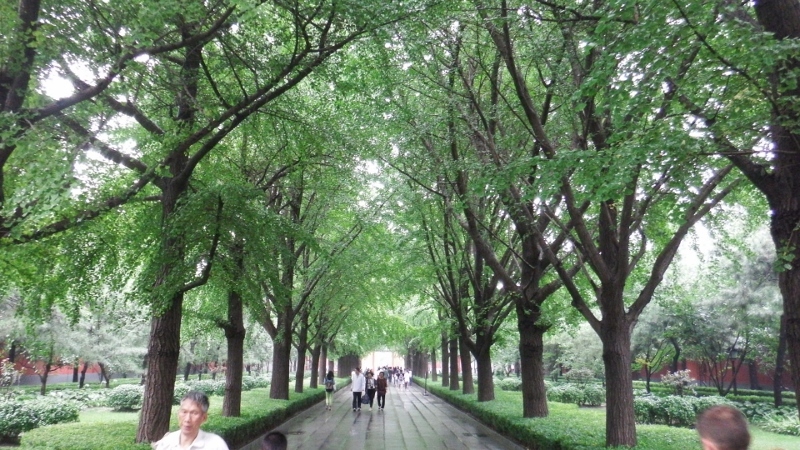 The walk leads into the Drum and Bell tower square. Sadly the two towers were closed although we couldn’t find out why. We assumed it was because the guards that normally look after these places were needed in Tiananmen square for crowd control. 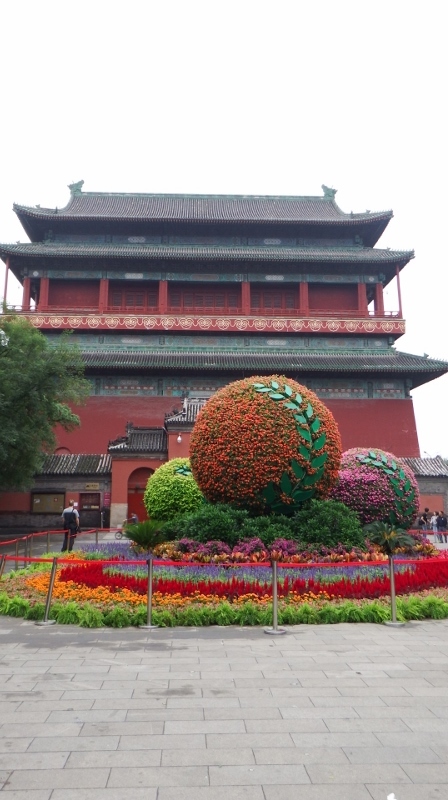 So we didn’t get to see inside but there was a beautiful flower display outside the drum tower. 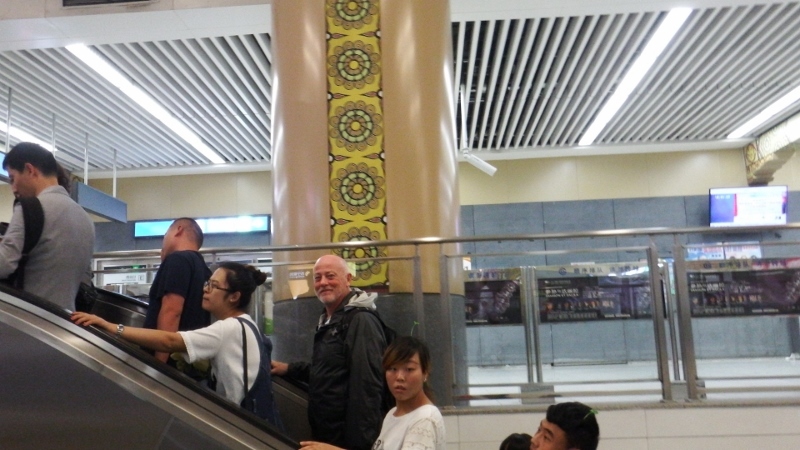 We returned to our hotel via the Metro pleased with our first day in China. Later we ventured two doors down from our hotel for a very tasty meal of stir fried duck and a shredded beef dish both with rice and chopsticks. The menu was translated into English so it was all very easy. I’m sure it’ll get harder. 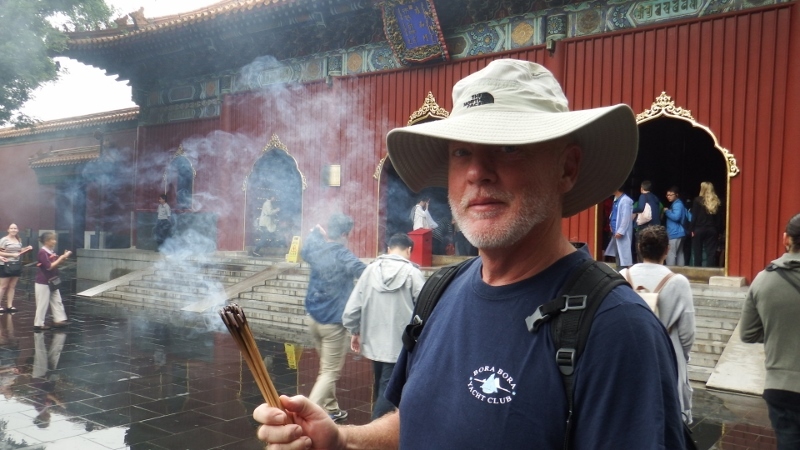 Posted on September 5, 2015, in Port posts, travel and tagged Beijing, Confucius temple, Drum and Bell tower Beijing, Hutongs, Lama temple. Bookmark the permalink. Leave a comment.